Bombay Brasserie in South Kensington has a reputation for Indian fine dining. This sumptuous restaurant has been serving authentic and eclectic Bombay and Indian cuisine here for over 30 years. Bombay Brasserie is included in the Best Indian Restaurants in London. I returned in 2015 to see the freshly designed interior and the new Bombay Bar, and to enjoy the very special Weekend Brunch. There is a mesmerising spirit wall with drinks of every hue and shade, and specializes in rare whiskeys as well as classic and inventive cocktails. There is also an extensive wine list. The Raj-inspired bar design combines the exotic essence of old Bombay with cutting-edge London. The Bombay Bar is open from 5.30pm Monday-Friday and 6.30pm Saturday and Sunday. You reach the restaurant through The Bombay Bar and enter a spacious dining room with a high ceiling and stunning over-sized crystal chandeliers. There is a man playing the piano in the corner and a large floral centerpiece. Courteous staff lead you to your table, then are ready to take your drinks order before explaining how the weekend brunch works. The room feels grand but not unwelcoming. It's still opulent but certainly comfortable and the chairs, and tables, are notably larger than normal. 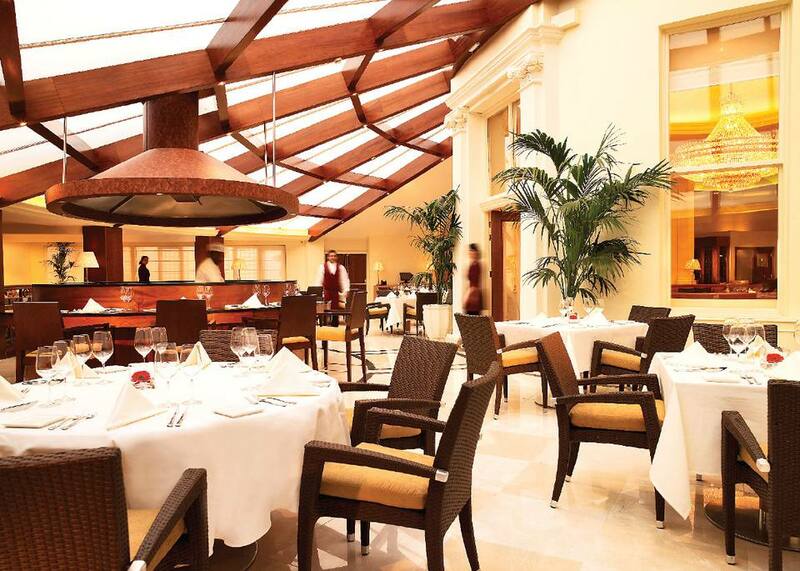 There is further dining space in the conservatory where the weekend brunch is served. This is a lovely light space and can accommodate large groups making it a good choice for special occasions. The marble flooring and the glass ceiling make this area much lighter whereas the main dining room, even though it is spacious, has more intimate low-level lighting. The immense brunch buffet is impressive. From 12pm to 3.30pm on Saturdays and Sundays you can enjoy much loved signatures dishes and old favourites such as the Palak Patta Chaat. Bombay's cuisine has blended the diverse cooking styles of Goa, Bengal and Gujarat with Imperial Mughal, Raj and even Portuguese influences. Chef Prahlad Hedge has been part of the Bombay Brasserie team since 1991 and uses only the freshest ingredients in his dishes, and he is in the restaurant during brunch so diners can ask questions. Within the conservatory there is a Live Chaat Counter serving Paani Puri and Bhel and a choice of other dishes from a regularly changing buffet menu. The starters were amazing and Sev Batata Puri - a beautiful collection of flavours in a bite size appetizer - is now one of favorite dishes here. It's a well-known chaat dish and popular Maharashtrian street food. Paani Puri was another example of the amount of preparation that goes into just one dish. You pour a spicy liquid into a crispy fried dough ball and savor the combined flavors. In the main course area there are lots of new and unusual dishes including chicken, lamb, fish and vegetable options, plus plenty of chutneys and accompaniments. There are no samosas or onion bhajis. And then there's the dessert table with amazing kulfi (Indian ice-cream) and other traditional sweet treats. The weekend brunch includes your tea and coffee at the end of your meal when you can sit back and admire the surroundings. When I visited I saw lots of Indian families with children and grandparents enjoying their meal. Staff are superb and service is very good. Meeting the chef is very nice extra for keen diners and I'm pleased Bombay Brasserie have been able to keep this custom. Would I return to Bombay Brasserie? Absolutely. The staff make you feel very special - this is service from a bygone era. The restaurant is large but intimate, and the flavorsome dishes are delicate but satisfying. Location Tip: Following my meal, I walked to the South Kensington museums (V&A,Natural History Museum, Science Museum) in around 10 minutes.